i) To plead Civil Suits in Civil Courts instituted against the Provincial Government, Gilgit Baltistan. ii) To file appeal before the District Court as well as Chief Court GB in favour of Provincial Government, as and when required. iii) To file Civil Suits and appeals before the Chief Court, District Courts and Civil Courts on behalf of the Provincial Government, as and when required. iv) To offer legal opinion to the District Administration as well as Provincial Government, to do any other task if assigned by the District Government and Provincial Government as and when required. Second Class or Grade ‘C’ Master’s degree in Law or equivalent qualification from a University/ College recognized by HEC. EXPERIENCE: Five (5) years post qualification experience in Legal/ Judicial matters. Candidates who have experience as practicing Lawyer of Courts and Prosecutors are required to provide detailed Cause List and a Certificate of having 5 years active practice from Bar Council duly verified by the Registrar High Court/ Office of the concerned courts. The Application Fee for posts (BS-14, 16 & 17 = Rs. 300/- ; BS 18= Rs. 750/- ; BS-19 = Rs. 1200/- ; BS-20 and above=Rs. 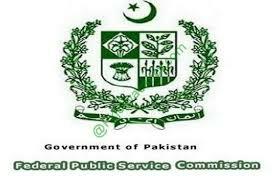 1500/-) may be deposited in the nearest Government treasury or in a branch of National Bank of Pakistan or in a State treasury authorized to transact business on behalf of Government under head C02101-ORGANS OF STATE EXAMINATION FEE REALIZED BY FPSC. Bank draft / Cheque/ Postal Order is not acceptable.